I’d seen the split shape of the US state of Michigan, and wondered if there was a way to cross from one to the other without going through another state. For example, one has to travel through the East Malaysian state of Sarawak to get between the two halves of Brunei. Which reminds me, I’ve been to Sarawak but not Brunei. I could even spend my Singapore dollars there! More just for curiousity than anything else. But I digress. Sortland is a town and municipality in Nordland county, Norway. It is part of the traditional region of Vesterålen. The administrative centre of the municipality is the town of Sortland. Other population centres in Sortland include Bø, Holand, Holmstad, Liland, Sigerfjord, and Strand. The Norwegian Coast Guard has its northern base in Sortland, called Kystvaktskvadron Nord. That’s clearly the wrong article. 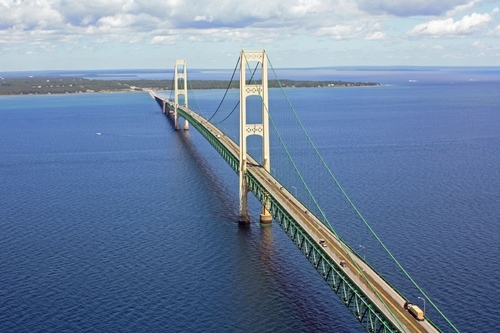 The Mackinac Bridge (/ˈmækɪnɔː/ MAK-in-aw) is a suspension bridge spanning the Straits of Mackinac to connect the Upper and Lower Peninsulas of the U.S. state of Michigan. The 722-square-kilometre (279 sq mi) municipality is the 153rd largest by area out of the 426 municipalities in Norway. Oh for Pete’s sake. Let’s try that again. It warms my heart that this exists.